Well that got me thinking and I guess, for me, it depends on how much we want to say. After all, we know that a picture says a thousand words, but then again, a thousand words penned in the right hand are worth so much more than the sum of their parts. I suspect that most of us are familiar with ‘Migrant Mother’ by Dorethea Lange. It is a memorable image from a series of work where she recorded what must have been the first motorised human migration. She turned her camera on the ‘Okies’, the displaced farmers of the American Mid-West who had watched their land dry out and their top soil just blow away. It happened across great swathes of Depression era America, an area that became known as the ‘Dust Bowl’. Times were tough. The banks foreclosed, and the people moved, en masse, to California where they became the itinerant agricultural work force so eloquently described by John Steinbeck in ‘The Grapes of Wrath’. This we know, and it adds poignancy to Lange’s work. We can see the suffering and the desperation. We know the back story. We connect. Dorethea Lange achieves the thing, which for me, raises a mere photograph into the realms of art; she evokes an emotional response from us. This picture, The Migrant Mother, really does say a thousand words. John Steinbeck was also at work recording the Okies. He was working for the San Francisco News on a series of articles that would record their plight. In the end he produced seven pieces, and it was this embryonic work that gave birth to The Grapes of Wrath. Steinbeck was introduced to a lot of the migrant camps by Tom Collins (later to become the inspiration for Jim Rawley, manager of the Wheatpatch Camp in his forthcoming novel), he told Collins that in his articles for the News he would “be very careful to do some good and no harm”. Steinbeck was striving to tell the truth of their plight in much the same way as Dorethea Lange. 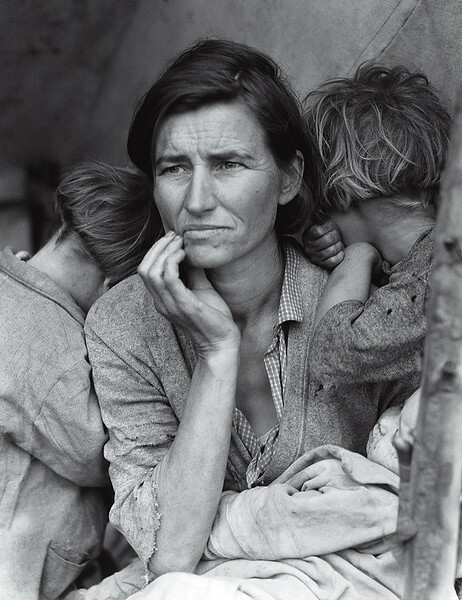 I mention this because there is a book ‘The Harvest Gypsies – on the road to the Grapes of Wrath’, it contains the seven essays that Steinbeck wrote for the San Francisco News and pairs the work with the photography of Dorothea Lange and others ... and together, they say so much more. The work of Dorothea Lange moves us, but when we look at them and read the words of Steinbeck, the pair of them move us to tears. Steinbeck’s second essay tells of a fall from grace, of a family with fifty acres of land and a thousand dollars in the bank now squatting in an illegal camp in a house made from cardboard ... and how much better off they are than their neighbour. Their neighbours are a family of six living under some rotten canvas with a quilt to share and disease has come to visit. Then he tells how this family, in turn, is better off than its neighbour, a family living in a carpet under a few branches, a family where death is a regular visitor “where the loss of dignity and spirit have cut them down to a kind of sub-humanity”. He then tells how the first family’s plight will worsen and how they will be like their neighbours with the carpet in a years’ time! Read the book, it’s published by Heyday Books, it brings such depth to pictures that were already good. Just don’t take it on holiday as it’s not very cheery. I started reading it after my wife and I embarked on a trip to Belize, I had to abandon it and finish it when I got back home. 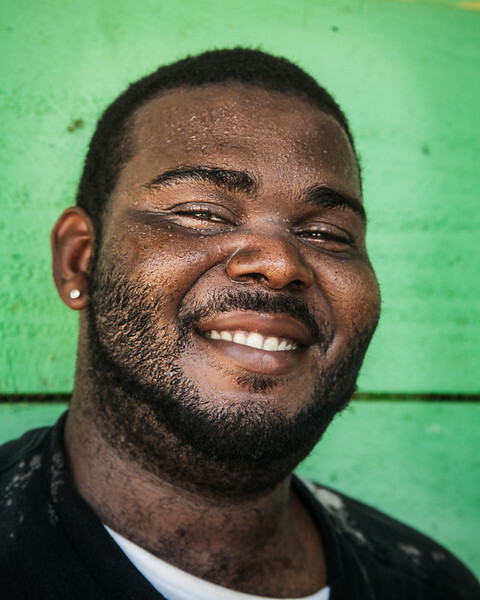 This young man lives in an area populated by the Garifuna, an ethnic group with a distinct history. In 1635 two Spanish ships carrying slaves to the West Indies were ship-wrecked near St. Vincent. The slaves escaped and were welcomed and protected by the indigenous Carib Indians. Their intermarriage formed the peoples now known as the Garifuna. A hundred and fifty years later the British took control of their islands and deported the Garifuna, en masse, to Honduras. The Garifuna now number some 77000 and are spread between Belize and Nicaragua. They have strong traditions including food, music and dance that link them directly to their West African heritage. And now these words have given you the same insight that I had when I took these photographs. Perhaps now, instead of seeing a man grinning for the tourist that asked to take his photo, you see a man grinning because today is going to be a good day; and that glint in his eye? Well, I’d like to think that that’s a touch of pride ... proud to be part of such a long, unbroken tradition and proud to be a part of what’s going to happen tonight.